Red Velvet Cake is unbelievably MOIST and fluffy, made with cocoa powder, buttercream, and sour cream, ready to frost in only 45 minutes! 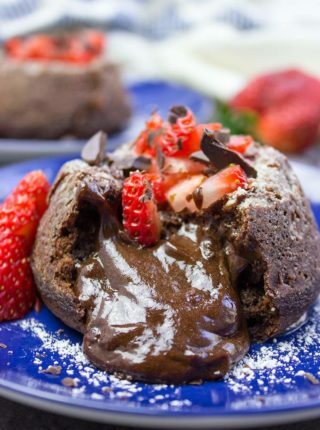 We’re almost ready for Valentine’s Day, and today we’re sharing our favorite v-day recipes like Red Velvet Cupcakes, Chocolate Lava Cake and Chocolate Truffles. Red Velvet Cake is a CLASSIC recipe, made from sour cream and buttermilk for an incredibly moist and velvety texture, along with cocoa powder and food coloring to help give it the signature red color. Make this cake with my cream cheese frosting, and top with chocolate shavings, cookie crumbs, red sprinkles or cake crumbs if you like trimming the tops of your cake layers flat (I don’t trim mine). 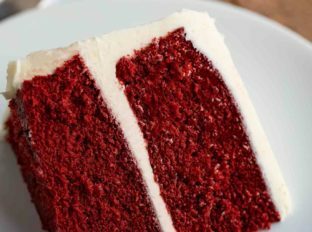 This red velvet cake recipe is also perfect for making layer cakes, cupcakes, or even cake pops. You can use piping tips for the cream cheese frosting to add decoration to the top of the cake, or just decorate with extra red velvet crumbs! WHAT MAKES RED VELVET CAKE DIFFERENT FROM CHOCOLATE? 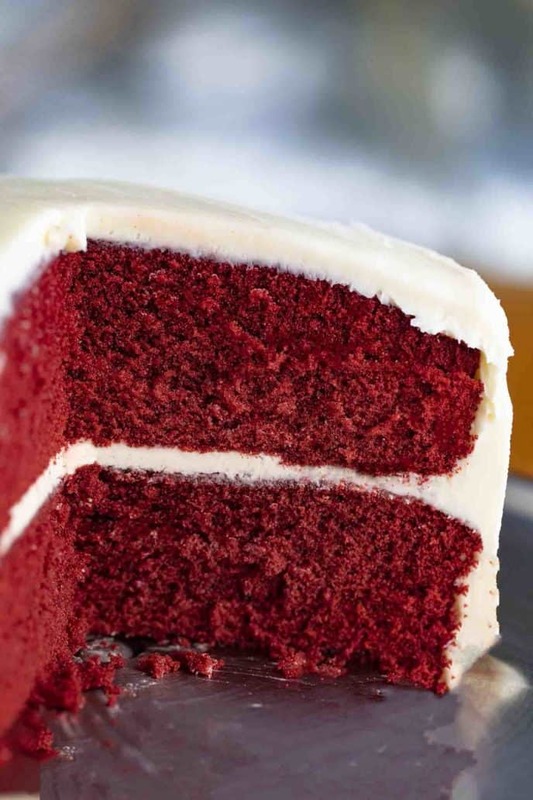 Red velvet cake has its signature red color, but it’s more than just chocolate cake with red food coloring. 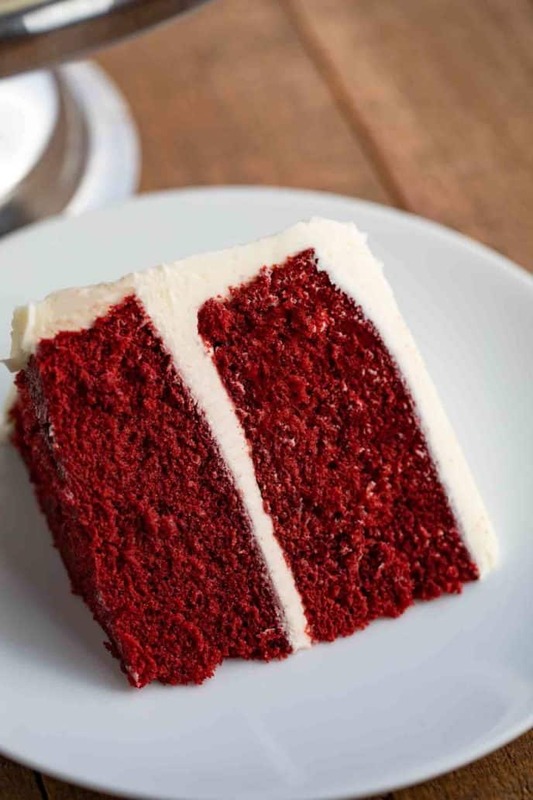 Red velvet cake also has acidic ingredients like buttermilk and sour cream, which react with the cocoa powder to turn it red and give it a fluffy texture. Some red velvet cake recipes also contain vinegar for this reason. Most dutch-processed cocoa powders you’ll find nowadays are treated differently when they’re produced, so it’s hard to get the red color from just the ingredients, which is why you’ll see red food coloring in most recipes now. Chocolate cake also has more cocoa, while red velvet cake just puts enough in for flavor and color, but it’s not a true chocolate cake. Frost the red velvet cake with cream cheese frosting, then top with mini chocolate chips, meringue cookies, or white chocolate chips. Add cream cheese frosting between each cake layer, then dust the top with confectioner’s sugar or drizzle with chocolate ganache. After frosting, top with chopped pecans, walnuts, or almonds. 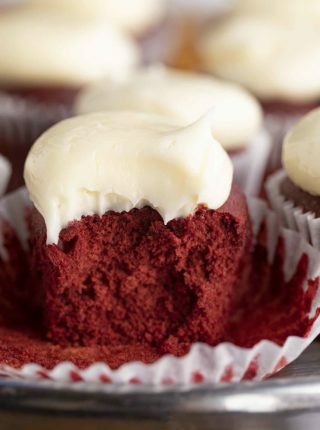 Red velvet cake can be stored at room temperature, but if you add cream cheese or buttercream (dairy-based frosting) I would recommend refrigerating your red velvet cake for up to a week. 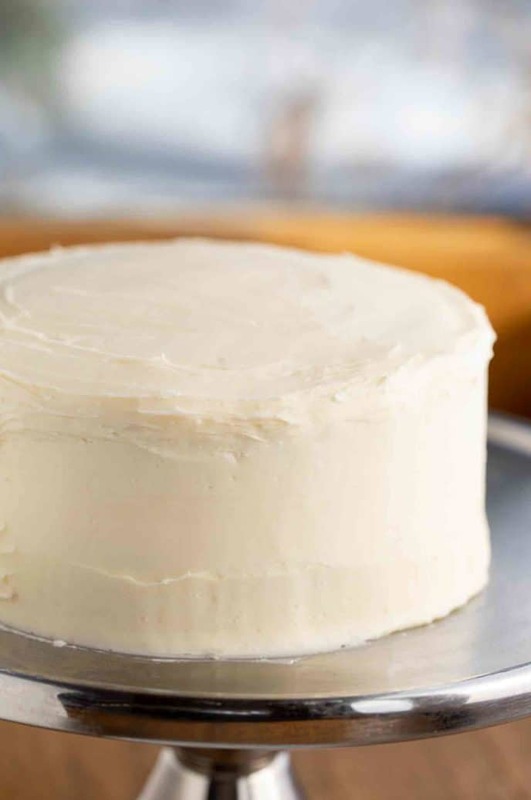 I always use cream cheese instead of buttercream frosting, because the flavor of the cream cheese is perfect for this type of cake, and makes the traditional melt-in-your-mouth flavor we’re looking for. If you don’t have frosting and just leave this red velvet on the counter, it will last 2-3 days. You can also freeze this cake fully decorated. Freeze for an hour or so uncovered, then when the frosting is frozen, wrap in plastic wrap and freeze for up to 3-4 months. You can use gel or liquid food coloring for this dessert, but you may need to add more liquid than gel to get the color you want. 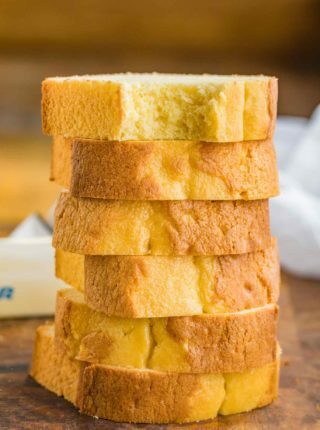 Cake flour gives cakes a lighter and finer texture compared to all purpose flour. If you don’t have cake flour flour, you can substitute 1 cup (14 tablespoons) of all purpose flour, plus 2 tablespoons cornstarch. 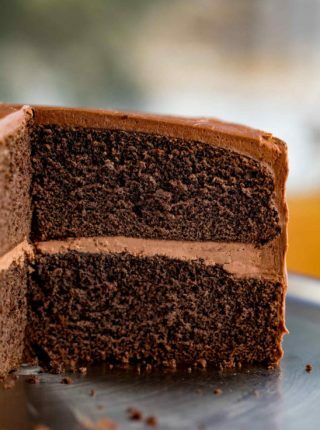 Because this cake is similar to chocolate cake, you can add more flavor with a tablespoon of espresso powder or bold instant coffee powder. Beetroot used to give red velvet cake its red color, when other ingredients weren’t regularly available. Now you’ll find food coloring in its place but you can still use it as a natural alternative. Watch your cooking time and temperature to keep this red velvet cake recipe as moist as possible. The cake is done baking when a toothpick comes out clean. I like to check it about 5 minutes before it’s supposed to be done, just in case, then increase the baking time as needed from there. Use good quality cake pans to make this red velvet. Good pans will conduct heat better, and your cake will turn out with better texture and won’t burn on the bottom. Buttercream is ideal, but if you don’t have it you can curdle regular milk with 1/2 teaspoon of lemon juice. Let it sit for a few minutes before using for this red velvet cake recipe. Add some sprinkles or food coloring into the cream cheese to make the frosting more decorative. Red Velvet Cake is unbelievably MOIST and fluffy, made with cocoa powder, buttercream, and sour cream, ready in only 45 minutes! Sift the flour, cocoa powder and baking soda into a large bowl and add the baking soda to it. In a stand mixer whisk together the butter and sugar until light and fluffy, then add in the eggs one at a time. Whisk in the sour cream, milk, red food coloring and vanilla then add in the flour until just barely mixed in (do not overmix). Pour into two 9-inch cake pans and bake for 30 minutes or until a toothpick comes out clean and let cool completely before frosting. My wife and I made this together yesterday and can I just say it turned out fabulous. Nice and moist, great texture, very rich and yummy. Thanks so much for coming back to let me know how much you both enjoyed it! This is a gorgeous red velvet cake!! We loved it! This cake looks DIVINE! Love that cream cheese frosting on top! I am going to make this this weekend! My friend will love it for her birthday! How sweet of you! Hope she enjoys it! This was a huge hit in my house! Everyone loved it! Yay! Thanks for coming back to let me know. This is the perfect red velvet cake! So moist and fluffy!